About Blue Water Designs, LLC. 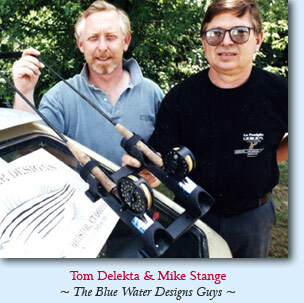 Blue Water Designs was established in the latter part of 1994 by Mike Stange and Tom Delekta. We are located about a half mile from ESPN in Bristol, CT.
Mike Stange and Tom Delekta like to fish a lot. Tom always complained that there was no place to store his fly rod on his boat or car. They put their heads together that year and developed the "Delstang" Fly Rod Holder / Transporter. In 1995 they entered The Fly Rod Tackle Dealer Show in Denver, Colorado and came back with a Top Ten Best of Show Award. We are still producing the product today. Tom has been an avid Fisherman all of his life. Tom was born in Bristol, CT and worked at the family store, Fall Mountain Sports. Tom fished whenever he got a chance. Tom got to fish from Canada to the Flordia Keys, the Yucatan, and Belieze in Central America and caught many different species of fish. Today, Tom runs Fall Mountain Outfitters in Torrington, CT and is considered as an expert in fishing. 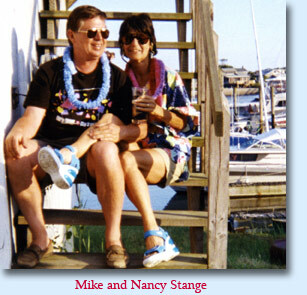 Mike Stange also has been an avid fisherman since the 1960's and took up fly-fishing in the 1980's. Mike was born in Bristol, CT and has run The Stanhelm Mfg. Company in Bristol, CT since 1981 and Blue Water Designs since 1994. Mike met his future wife Nancy and were married. Nancy is an avid boater and loves the water. Together they fish and work as many Fishing Shows as possible. 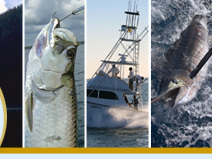 In August 2006 Blue Water Designs was acquired by Patriot Manufacturing and continues to meet the needs of the fly fishing industry.